Homes in Tuckerton, N.J., after Hurricane Sandy. Estimates indicate the storm could rank as the nation’s second-worst for claims. WASHINGTON — The federal government’s flood insurance program, which fell $18 billion into debt after Hurricane Katrina, is once again at risk of running out of money as the daunting reconstruction from Hurricane Sandy gets under way. Don Horneff, 74, in his yard in Tuckerton, which has not taken federally recommended steps to protect homes from flooding. Early estimates suggest that Hurricane Sandy will rank as the nation’s second-worst storm for claims paid out by the National Flood Insurance Program. With 115,000 new claims submitted and thousands more being filed each day, the cost could reach $7 billion at a time when the program is allowed, by law, to add only an additional $3 billion to its onerous debt. Congress, just this summer, overhauled the flawed program by allowing large increases in premiums paid by vacation home owners and those repeatedly hit by floods. But critics say taxpayer money should not be used to bail it out again — essentially subsidizing the rebuilding of homes in risky areas — without Congress’ mandating even more radical changes. “We are now just throwing money to support something that is going to end up creating more victims and costing more money in the future,” Representative Earl Blumenauer, Democrat of Oregon, said of the program, which insures 5.7 million homes nationwide near coasts or flood-prone rivers. Even with the new rules, critics argue, it will be many years, if ever, before many homeowners are required to pay premiums that accurately reflect the market cost of the coverage. Some communities have long resisted imposing more appropriate building codes to prevent damage, putting the program at further risk of devastating losses when storms like Hurricane Sandy hit. And despite some efforts in recent years, many of the flood maps the program relies on are out of date — which can have expensive, and even deadly, consequences in this era of rising sea levels if homeowners are not cognizant of the risks they face. The program’s giant debt makes matters worse because simply covering the interest owed the Treasury consumes from $90 million to $750 million a year, depending on interest rates. This means it is much harder to build reserves for future catastrophes. But others on Capitol Hill argue that the changes adopted in July are an important first step, and that Congress must give the Federal Emergency Management Agency, which runs the program, a chance to apply them before any additional changes are considered. 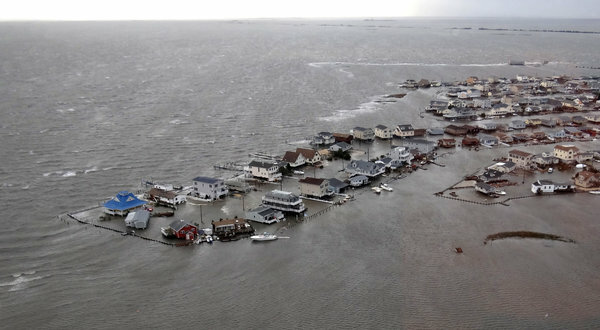 Already, 44 members of the House of Representatives have called for Congress to appropriate whatever money is needed to help victims recover from Hurricane Sandy, and aides on Capitol Hill say that under such extreme losses, they expect lawmakers will do what they have to do to keep the program solvent — even amid a federal budget crisis. The federal government’s flood insurance program, established in 1968, is one of the world’s largest. The insurance is mandatory for homeowners with a federally backed mortgage if they live in an area subject to flooding at least once every 100 years. The average annual flood insurance premium is about $615, but for homeowners in areas at higher risk of flooding, an annual policy can cost from $1,200 to $3,000, according to Steve Harty, president of National Flood Services, a claims-processing company, depending on the level of coverage. The federal program collects about $3.5 billion in annual premiums. But in four of the past eight years, claims will have eclipsed premiums, most glaringly in 2005 — the year of Hurricanes Katrina, Rita and Wilma — when claims totaled $17.7 billion. Private insurance companies have long avoided offering flood insurance to homeowners. But the program is still a moneymaker for the private insurance industry. Even though these companies bear none of the risk, they take, on average, $1 billion a year of the premiums the government collects, as compensation for help in selling and servicing the policies. Federal auditors argue the payments are excessive. FEMA officials declined to address whether changes beyond the already passed legislation are needed to strengthen the program. More than one million property owners who live in homes at least four decades old also have historically paid only about 40 percent of the estimated true cost of the coverage the government provides — in large part because of lobbying by the real estate industry, mortgage brokers, homeowners associations and other groups to keep federal authorities from charging more. An analysis of two decades of claims by the Wharton Risk Center at the University of Pennsylvania shows that certain states, like Texas, which has the second-largest number of policies, pay much less in insurance premiums than the homeowners there collect in damage claims, evidence of the inherent inequity in the national program. The problem of repetitive claims is much less prevalent in coastal New York and New Jersey, where FEMA estimates Hurricane Sandy flooded 100,000 insured homes. But homeowners in those two states have fought measures that would reduce storm damage. Barrier island communities in the Northeast, for example, have resisted overtures from the Army Corps of Engineers to build sand dunes as a natural flood barrier, arguing that the dunes would block ocean views or harm the local tourism industry. Other communities, like Tuckerton, N.J., have failed to take steps recommended by FEMA to better protect homes after flooding through a program that pushes owners to elevate new homes above minimum required heights or to move flood-prone buildings. Hurricane Sandy damaged more than 300 of the 660 houses in Tuckerton’s beach area, including 22 that were washed away, according to Phil Reed, the town building inspector. Fifteen years ago, Don Horneff, 74, had his Tuckerton house raised on pilings nine feet above ground level. As a result, he said, Hurricane Sandy’s floodwaters ran only through his basement. That is the kind of protective measure that federal officials want mandated into all new or rebuilt homes in flood zones. The pending costs for Hurricane Sandy would have been even higher if a greater share of residents along the East Coast had signed up for the insurance, which is voluntary outside the 100-year-flood zones. There would also have been more premium dollars, though not enough to pay the claims. The fact that many homeowners hit by Hurricane Sandy have no flood or homeowners insurance could prompt Congress to provide assistance to the uninsured, too, as happened after Hurricane Katrina, further raising the cost to the federal Treasury. Officials in New Jersey and New York say the federal government must move quickly to put the flood insurance program back on stable footing, even if it means increasing the federal deficit. “All we want in our community — not any more and absolutely not less — is what is due to Sea Isle,” said Leonard C. Desiderio, the mayor of Sea Isle City, N.J., one of the coastal towns hit hard by Hurricane Sandy. Hurricane Katrina put the program so deeply into debt that federal officials have acknowledged they will never be able to fully repay the $18 billion Treasury-financed loan that bailed the program out. FEMA, as a result of this year’s legislation, has the authority to raise premiums by as much as 25 percent per year over the next five years. The increases will be imposed mostly on vacation homes and other properties that repeatedly flood, but whose owners have paid far below market insurance rates. The legislation also authorizes the creation of a national reserve fund to help the program handle major flood catastrophes, and urges Congress to appropriate $400 million a year to update the thousands of out-of-date flood control maps. That would likely force new homes to be built elevated off the ground in spots where rising sea levels or recent major storms have had an impact. Lawmakers who pushed the legislation call it major progress in fixing the program’s well-documented failings. “The program is on a much more responsible path than it had been just one year ago,” said Zachary Cikanek, a spokesman for Representative Judy Biggert, Republican of Illinois, who co-sponsored the legislation. But others say much more needs to be done. The federal government should ensure continuous coverage in flood-prone areas, spreading the risk among a larger pool of homeowners, who now often allow their coverage to lapse, said Robert Hunter, an insurance administrator in the Ford and Carter administrations. Eric Lipton reported from Washington, Felicity Barringer from San Francisco, and Mary Williams Walsh from Philadelphia. Jon Hurdle contributed reporting from Tuckerton, N.J.